2015 Rock Hall Of Fame Class Includes Lou Reed, Joan Jett, Green Day : The Two-Way The Smiths and N.W.A. were left off of the list of inductees for the Rock and Roll Hall of Fame, as Hall voters opted for acts such as Bill Withers and Joan Jett and the Blackhearts. 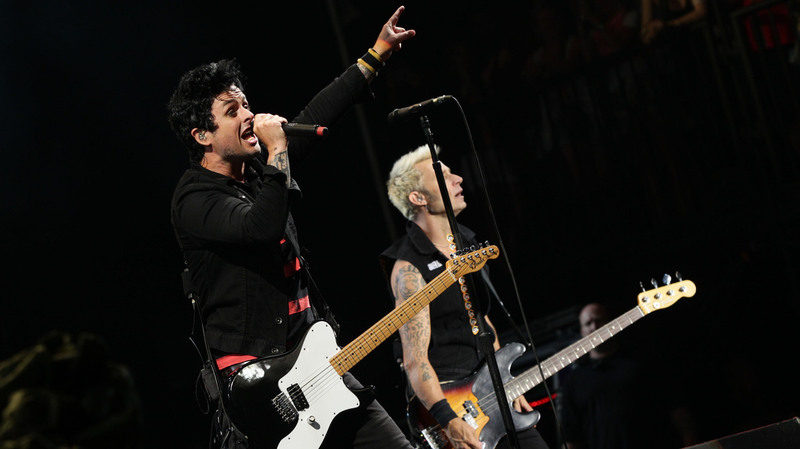 Billie Joe Armstrong (left) and Mike Dirnt of Green Day play the Reading Festival. Green Day and five other acts will join the Rock and Roll Hall of Fame next year. Both The Smiths and N.W.A. were left off the list of new inductees for the Rock and Roll Hall of Fame, as Hall voters instead chose acts such as Lou Reed, Bill Withers, and Joan Jett and the Blackhearts. They'll be welcomed to the Hall in April. "About 700 music journalists, performers and other industry insiders spent two months deciding on the six inductees," David C. Barnett of member station WCPN in Cleveland reports. Barnett adds, "Artists are eligible for induction 25 years after their first recording. Los Angeles soul singer Bill Withers' first album came out in 1971, but this is his first time on the ballot." While the list reflects a swath of musical traditions, we'll also note that the induction ceremony will only be attended by half of the central inductees: Paul Butterfield died in 1987, Stevie Ray Vaughan died in 1990, and Lou Reed died last year. The Hall of Fame voters decided not to induct nine other nominees: Sting, The Spinners, The Smiths, War, Kraftwerk, Chic, The Marvelettes, Nine Inch Nails and N.W.A.